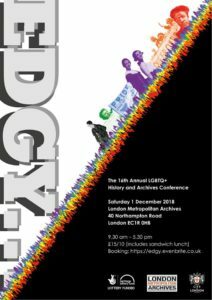 Rose Collis will be doing a 20-minute illustrated presentation about her new, in-development stage show and lesbian history/heritage project, Forty Years Out (And Counting) at this conference, in a session on ‘Lesbian Pasts’ that begins at 11.30am on Friday 15th March. 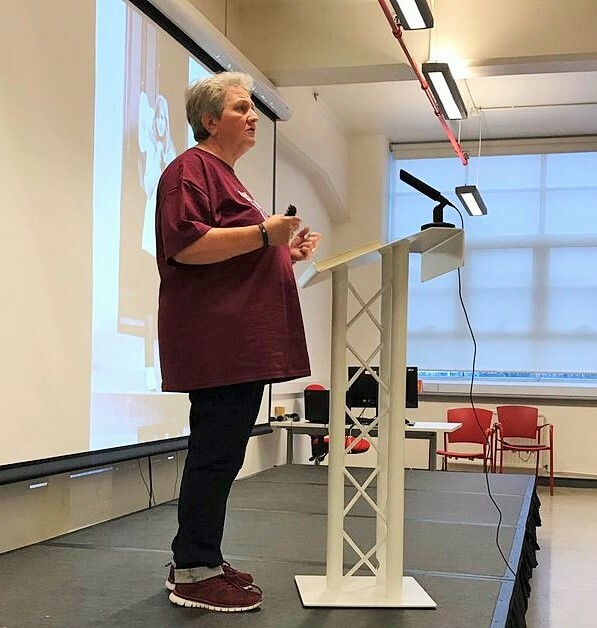 On November 14, Rose Collis was a keynote speaker at the launch of LGBT History Month 2019 at the British Library. The theme this year is Peace, Reconciliation and Activism. Rose gave an introductory speech about the plans for her ambitious new mixed media lesbian history/heritage project, drawing on both her experiences as a lesbian writer, performer and activist for forty years, and her extensive and unique archive curated during the last four decades. As we know, this year and next year contain significant anniversaries in LGBT history and in universal history: 100 years since the partial suffrage of women in the UK, and the ending of WWI, and 50 years since Stonewall. But they are also significant anniversary years for me: this year, it’s 40 years since I first came out as a lesbian, and next year, it will be 40 years since I went on my first Gay Pride March. 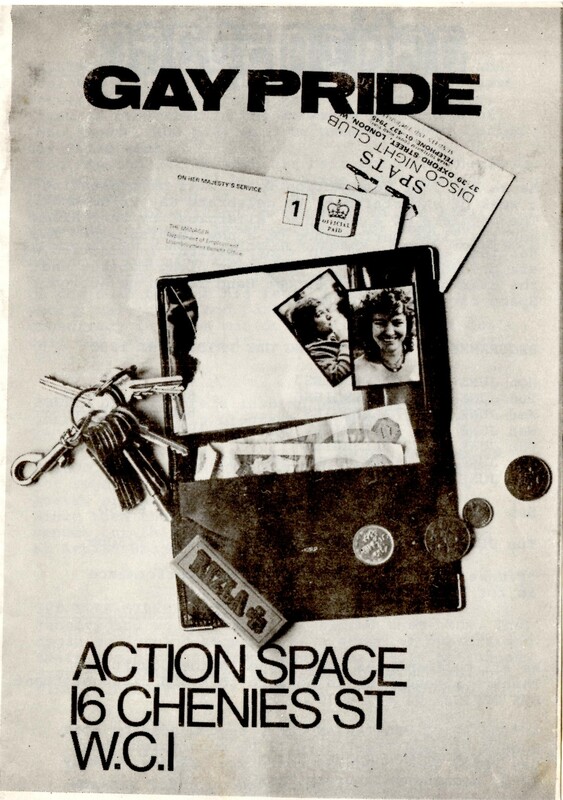 Both events marked the beginning of a 40 year (and counting) personal, political and cultural journey as lesbian activist, performer, writer and historian, reflected in my private archive which chronicles and reflects the social and political history and evolution of a community’s fight for equality and justice: the battles, campaigns, victories and losses. One of the great custodians of our past is Jan Pimblett at London Metropolitan Archives. The other week, she said to me, ‘You know, history is a set of examples’. There were the early Gay Pride and Lesbian Strength marches, in the days when the police outnumbered marchers by about 10 to 1 and, as I witnessed at Gay Pride 1980 and Lesbian Strength 1984, were only too keen to arrest and assault us on the slightest pretext. I was the first lesbian to join the group who produced the ground-breaking documentary Framed Youth, the first documentary made by and about lesbians and gay men under 25, for which we won the 1984 BFI Best Documentary Award. Then there was the lengthy and expensive battle to save Gay’s The Word when it was targeted by HM Customs & Excise. With other lesbians and gay men, including Lisa Power and Linda Semple, I took part in one of the most successful fundraising events in that campaign: the Maupin Marathon at the Fallen Angel: a 36-hour non-stop reading of the first four Tales of the City books, organised by Peter Scott-Presland, launched by Chris Smith MP and attended by Armistead himself. So, next year, to mark my anniversaries, some of these ‘examples’ will form the basis of Forty Years Out, a new solo mixed media stage show, written and performed by me, that will be very much ‘flagging up the lesbian’. This work will be the cornerstone of a major long-term multi-media project of the same name, comprising online and physical exhibitions and a variety of public engagement events throughout the UK, drawing on the rare material I have in my private archive. The show will re-visit, reflect and even re-enact some of the stories, the songs, the slogans, the sit-downs, the sorrows and the solidarity. The project will be one of celebration, creation, commemoration, discrimination and demonstration. All very much in keeping with next year’s History Month themes. Unfortunately, for too many years, there was a great deal of activism, scant reconciliation — and bugger-all peace. This was no more true than during the four years I spent at that wonderful magazine City Limits from 1985, when I was appointed the first lesbian co-editor of the ‘Out in the City’ listings and news section, which my late colleague Brian Kennedy had created. 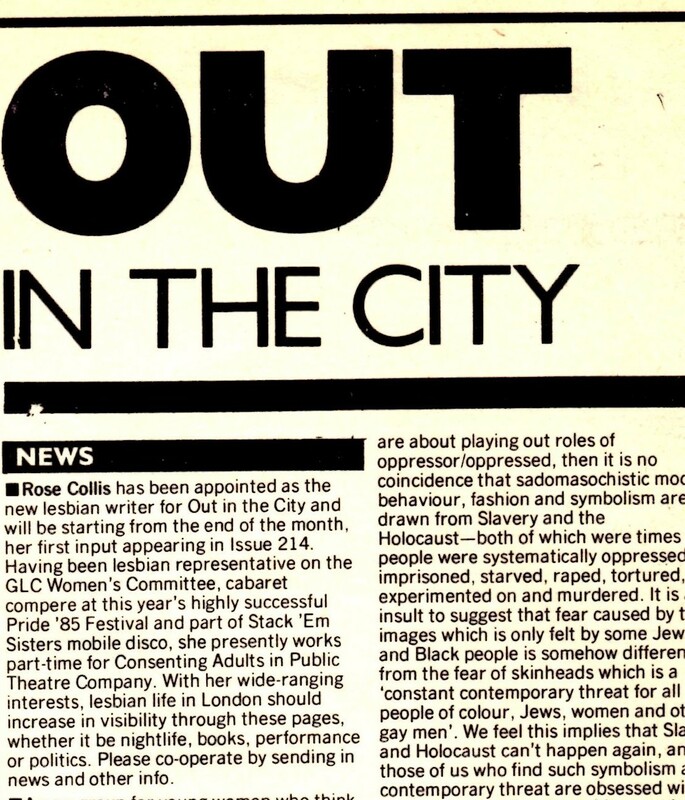 City Limits was the first non-gay magazine to have a lesbian writer on its staff hired specifically to cover all things lesbian, both in our own right and within what used to be called a ‘mixed gay community’. On just one day a week, I covered the lesbian waterfront: clubs, pubs, publishing, theatre, music, cinema, television, art and activism. The first feature I ever wrote was, appropriately, about director Greta Schiller and her documentary Before Stonewall. And, from then onwards, for City Limits, Gay Times, Shebang, Spare Rib and Diva, I began to write articles about lesbian history, which was then neither trendy nor the foundation for a career. During those years at City Limits, Brian and I were at the forefront of the fight against two major enemies that could have destroyed our community, yet which had a powerful mobilising effect. I lost people I had campaigned with, worked with, marched with, screamed with, grown up with. Historically speaking, I cannot remember another time – before or since — when a health crisis in this country was used as a socio-political weapon against the sector of the community most affected by that crisis. And with so many gay male friends and colleagues dying on a depressingly regular basis, the parallels between a generation of young men being lost in WWI, and what was happening from the early 80s onwards, were startling. And the emotional, social and psychological damage no less profound. The second enemy was, of course, Section 28. Together, we marched, we wrote, we spoke out. We witnessed the founding of Stonewall at Ian McKellen’s house. We even donated — when Michael Cashman gave me an exclusive interview, and The Sun stole portions of it and were forced to make a donation to the ‘Stop the Clause’ campaign. Those are just some of our, and my, ‘examples’. So, today, as we reflect on the historic anniversaries of this year and the next, let us resolve to continue to be custodians of the past — with no erasing and no exclusions. So that those in another time WILL remember us, AND those who went before us, AND those who fought battles with us, and who we have lost in those times of Peace, Reconciliation and Activism. 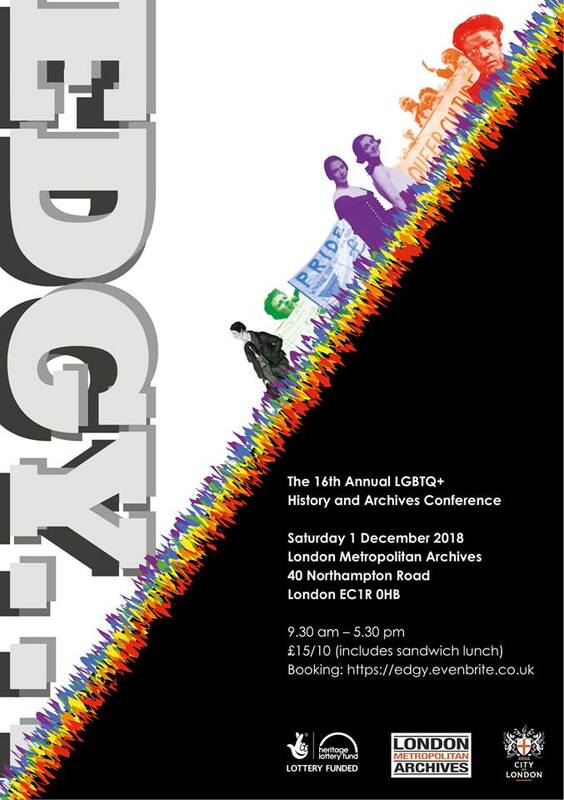 Rose Collis was a keynote speaker at Edgy: The 16th LGBTQ+ History and Archives Conference at London Metropolitan Archives on December 1, 2018. This LGBTQ+ History conference explores ideas of ‘Outsider History’. The margins can be a powerful place rather than a place of exclusion. But what happens when people get excluded from mainstream memory through lack of resources or time? What happens when Outsider History strives to become part of the centre? How does the history get defined? Are aspects of history obscured in an effort to make things palatable and acceptable? Rose Collis unveiled Forty Years Out: An Outsider Lesbian’s Inside Stories, a brand new presentation with visuals and music, followed by Q&A. This was a rare opportunity to explore forty years of history, featuring first-hand anecdotes, cuttings, photos, objects and ephemera from Rose’s substantial private archive — a ‘taster’ for a major multi-media project that will be produced from 2019 to mark forty years since her first Gay Pride march. Subject to funding, this will feature a new solo stage show, an online/physical exhibition and a variety of public engagement events throughout the UK. 33 years ago a valiant troupe of British LGBT folk did a marathon public reading of the first 4 Tales novels at a queer pub in London called the Fallen Angel. As I recall, lasted thirty-some hours The performers slept in sleeping bags on the floor until they were needed again. It was a benefit for Gays the Word, which had recently been raided by Thatcher’s goons for importing my books, among others. The role of Connie Bradshaw was played by a feisty young woman who went on to become one of Britain’s most formidable activists. Islington’s Pride IslingtonsPride Sensational talk by @RoseCollis1 looking back at the 40 years of Lesbian activism and support. Well done. Thank you.